Savannah, Georgia is one of the most beautiful and fascinating cities in the Southern United States. It has been painstakingly preserved and restored, so visiting this small Southern city feels like stepping back in time. From the live oaks dripping with Spanish moss to the elegant antebellum mansions, Savannah maintains the look and feel of another time. Despite its historic charm, Savannah is also a very forward-thinking city, with a vibrant arts culture and a bohemian feel. 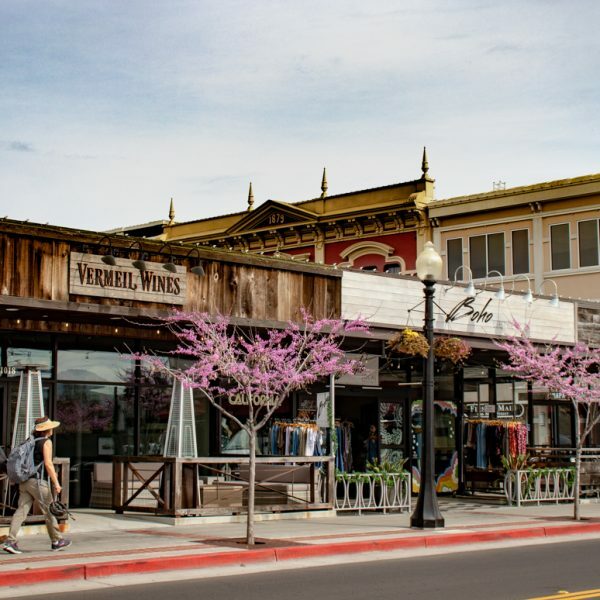 It’s also the perfect place to spend a weekend exploring local food, history, culture, and shopping! Here are my top tips for a first-time visiting Savannah. Savannah is a very pedestrian-friendly city. When it was first founded, it was laid out in a grid pattern around 22 tree-lined public squares. These beautiful historic squares make walking around is very enjoyable, and you can easily get around all of downtown and the historic district on foot. That being said, there is very little public transportation in Savannah, so if you want to go further afield (like to nearby Tybee Island on the coast) you will need a car. Uber and taxis are available around most of Savannah. Forsyth Park: This beautiful park is a popular spot for locals and tourists alike. You can easily spend a whole afternoon relaxing under the live oaks and people-watching. 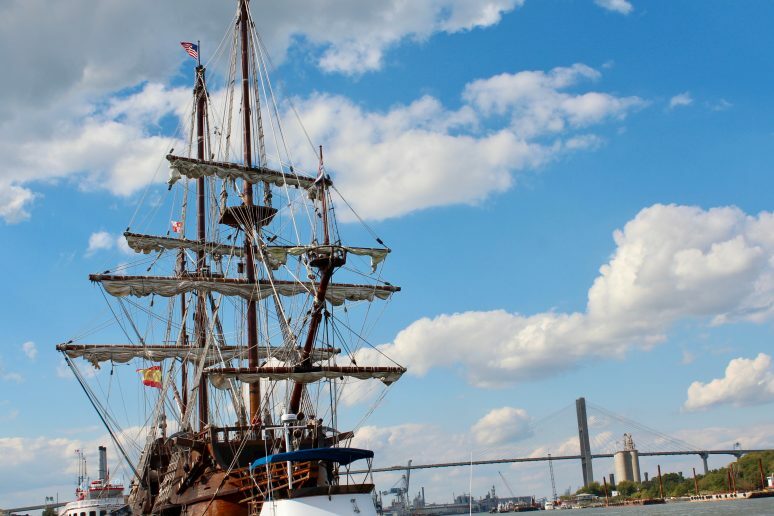 Visit the riverfront: Savannah was once a bustling port city, and the riverfront area has now been turned into a bustling shopping street. Check out an art museum: Savannah is a city known for art – after all, it’s home to the famous Savannah College of Art and Design. If you want to check out some art on your visit I recommend the SCAD Museum or the Telfair Museum. 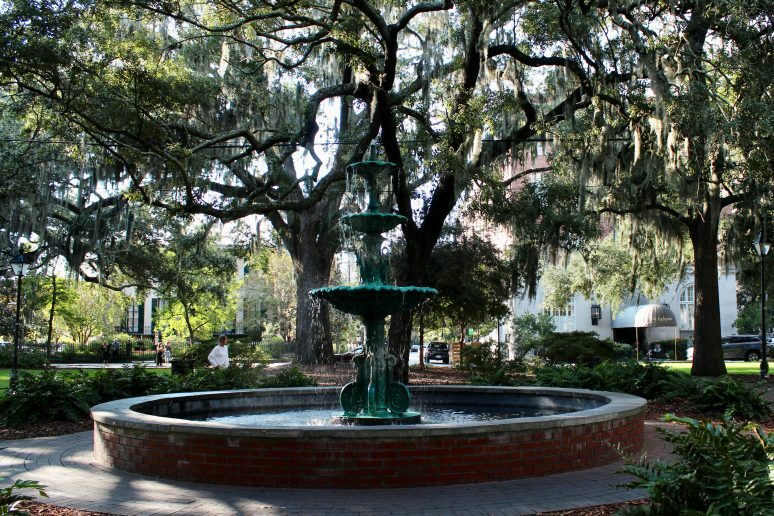 Walk through Savannah’s squares: Savannah contains 22 historic squares, each one like a miniature park. Some of the prettiest squares are Monterey Square, Lafayette Square, and Oglethorpe Square. 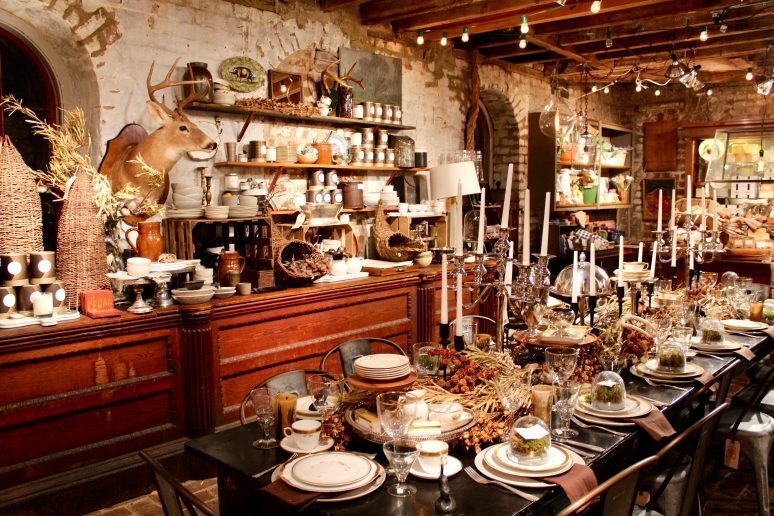 Go shopping: From local boutiques to unique design stores to gourmet candy stories, you can find it all in Savannah. One of the best places to go shopping in the city is Broughton Street. Bonaventure Cemetery: Made famous by the book Midnight in the Garden of Good and Evil, Bonaventure Cemetery is a beautiful (and creepy!) cemetery with lots of Southern Gothic flair. Take a ghost tour: Savannah is supposedly one of the most haunted cities in the United States, after New Orleans. There are plenty of ghost tours running nightly that will take you through some of the city’s spookiest spots. Eat some comfort food: Don’t miss eating some authentic Southern comfort food on your trip to Savannah! The best place for it is Mrs. Wilkes’ Dining Room, where you’ll be served heaping plates of comfort food “family style” at communal tables. Cafe M: This adorable French patisserie right by the river has delicious macarons, pain au chocolat, and croissants. It’s the perfect place to stop for a quick breakfast or snack. Collins Quarter: Run by Australian expats, Collins Quarter is the best place to go for brunch in Savannah. They have delicious brunch favorites like avocado toast, eggs Benedict, and brioche French toast. Soho South Cafe: Chic, fun restaurant housed in a former automotive service station. Really good soups and sandwiches, perfect for lunch or dinner. Mrs. Wilkes’ Dining Room: If you only eat one meal in Savannah, it should be lunch at Mrs. Wilkes’ Dining Room! Family owned since 1943, this restaurant serves traditional Southern comfort food at communal tables. 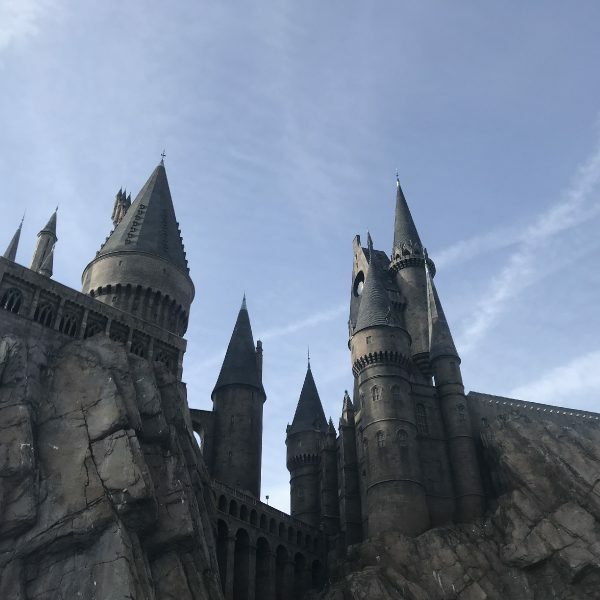 They’re only open from 11 AM to 2 PM on weekdays, so get there early to avoid waiting in line! Leopold’s Ice Cream: After a long day of walking around in the heat, Leopold’s is the perfect place to stop for some delicious ice cream to cool you down. If you love shopping, here are some of the most popular shopping streets in the city! Broughton Street: Broughton Street is the main shopping street in the city. 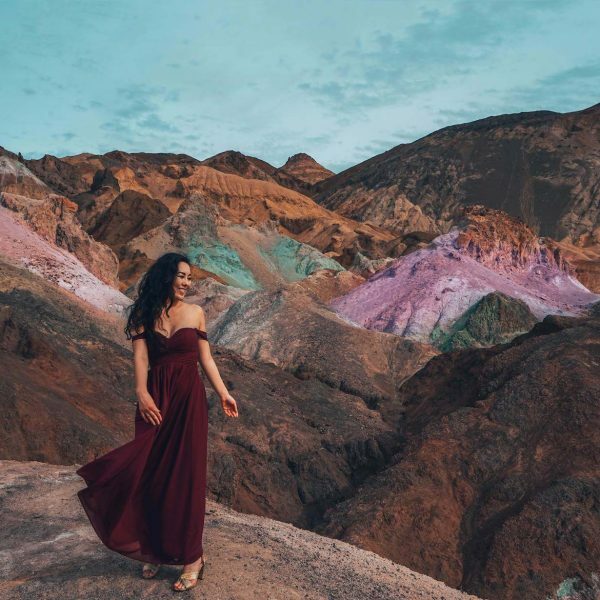 You’ll find brand name stores like Free People and Urban Outfitters along with smaller boutiques. Don’t miss the beautiful Paris Market concept store. Whitaker Street: Located near Forsyth Park in Savannah’s Downtown Design District, Whitaker Street is home to lots of cute boutiques and design stores. River Street: This charming cobblestone street is located right along the river, as the name implies. While it’s pretty touristy, it’s the perfect place to go if you want to do some Savannah souvenir shopping! In my opinion, the best time of year to visit is fall! Many of the historic mansions will be decorated beautifully with pumpkins and fall foliage, and if you’re interested in the spooky/haunted aspect of the city, then what better time is there to go than around Halloween? The weather is subtropical meaning it is warm and humid all the time. Summers are the hottest, with temperatures reaching into the nineties during most of June through August. Spring and fall are a little cooler, but even during winter it never gets truly “cold” in Savannah with temperatures rarely dipping below the sixties! I highly recommend reading Midnight in the Garden of Good and Evil by John Berendt before your visit. This is the book that launched Savannah to fame in the 1990s. 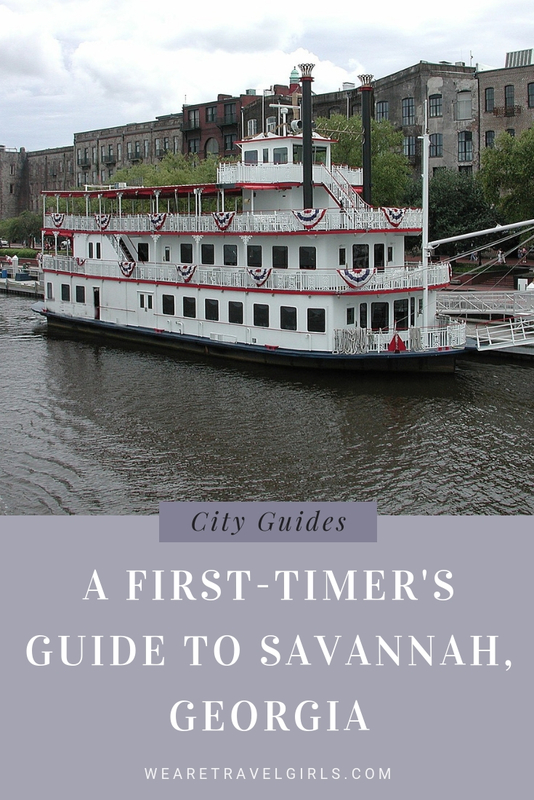 Before its publication, Savannah had been forgotten about by most of the country. However, this book revitalized tourism in the city and made it more popular than ever. It’s a dramatic retelling of a true crime story that occurred in Savannah in the 1980s, and it paints a fascinating portrayal of Savannah, its history, and its residents. If you weren’t already planning a trip, reading this book will make you want to book a plane ticket and go as soon as you can! Cathedral of St. John the Baptist: a Beautiful church that’s supposedly haunted. Chippewa Square: Home to the famous bench where Forrest Gump sat! Mercer House: The historic mansion from Midnight in the Garden of Good and Evil. Jones Street: Voted the most beautiful street in America by Southern Living. 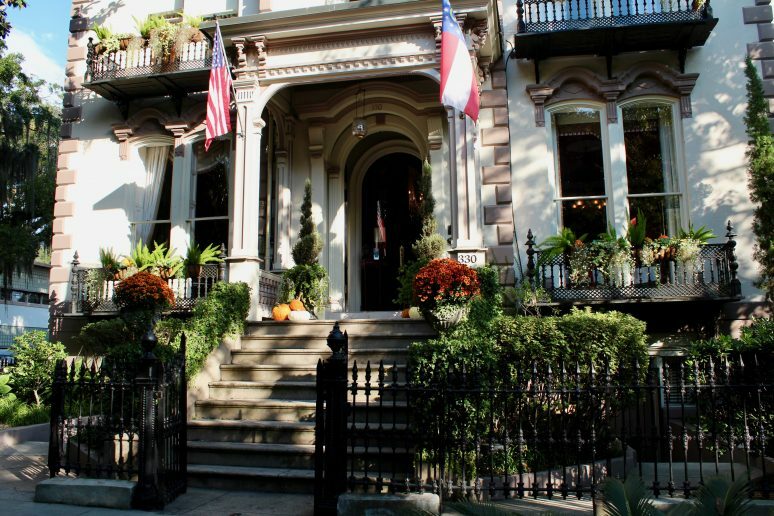 Owens-Thomas House: Another beautiful historic mansion in Savannah. Sorrel-Weed House: a Historic mansion that is also supposedly haunted! Juliette Gordon Low House: Home to the founder of the Girl Scouts. ShopSCAD: Buy local art from SCAD students and alumni. Savannah, Gerogia is truly a wonderful city and I hope this post has inspired you to plan a visit sometime soon! Have you ever been to Savannah? If you have any additional tips for our readers or questions please leave these in the comments below. Yes, Savannah is gorgeous in the fall and at Christmas time. Broughton St. is beautifully decorated and the atmosphere is very festive. Being a Savannah native, I tend to over look so many of the pretty places you can visit here. This post was really helpful for me to rediscover my city. Thanks! Thanks Ashleigh! I am jealous you’re a Savannah native – it’s such a pretty city! Savannah is an “open container” city which makes it loads of fun for a gals visit. These are great places to visit in Georgie. Looks like I’ll have to do a road trip this summer.